Many people have conducted experiments on animal behaviour and psychology by offering them artistic supplies and seeing what the animals make of them. You've likely heard about the painting elephants and apes that seem to demonstrate the capacity for abstract thought and representation, although the academic jury is technically still out on whether or not these events constitute true abstract representation. Now before you get completely confused, this latest edition of Artist Spotlight isn't about the anime series Naruto, but rather about a monkey - a crested macaque, to be precise. Still confused? You're probably not alone there. Wildlife photographer David Slater was visiting a wildlife preserve in Indonesia several years ago, when he happened to leave his camera briefly unattended near a crested macaque - probably not the smartest move in and of itself, but something rather extraordinary happened. The monkey, named Naruto by the park staff, picked up Slater's camera and snapped a few selfies. 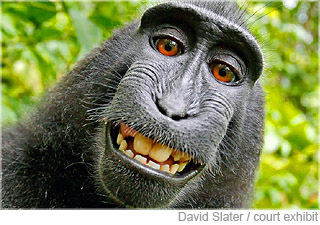 Slater then published these photos as a part of his book titled 'Wildlife Personalities', and the craze of so-called 'monkey selfies' was born. Things have recently taken a turn for the absurd, however, as the animal rights group People for the Ethical Treatment of Animals has filed a lawsuit on behalf of Naruto, arguing that Slater cannot claim ownership of the photos in question, as they were technically taken by Naruto, not Slater. Whether or not this lawsuit has any legal merit whatsoever has yet to be determined, but this isn't the first time the photos have caused legal trouble. In 2014, the online media repository Wikimedia refused to remove them from their own archives, on the grounds that nobody could technically claim ownership of the photos, as they were taken by a monkey. Slater, for his part, seems to have wanted to do the right thing from the beginning. He has actively worked with PETA in the past, and is somewhat baffled by their decision to pursue this legal avenue. "Had [PETA] contacted me I would support them in efforts to get animals recognised legally with an aim to promote animal dignity. Sadly they choose to attack me personally in this ridiculous way which puts me under more financial and emotional stress." No matter how you feel about the case, it's hard not to appreciate seeing the phrase 'monkey selfies' appearing in an official court brief. Thanks for the laugh, PETA.